The Pakistani government convened a meeting on Monday of nearly all of the country’s political parties, in an effort to consolidate broad national support for its military operation to crush Taliban militants in Pakistan’s northwestern Swat Valley. The leaders of 42 political parties were expected to attend the All Party Congress in Islamabad, the capital. In a separate move to pressure the Taliban, hundreds of Muslim clerics gathered in Islamabad on Sunday, to issue a unanimous declaration that denounced the militants’ violent tactics. “Suicide attacks and beheading is haram,” the resolution said. “Haram” means forbidden, according to Islam. National consensus was critical for the military offensive to succeed, said a senior foreign diplomat stationed in Islamabad. Speaking on condition of anonymity, the diplomat singled out Mian Mohammed Nawaz Sharif, leader of the PML-N party and the most powerful political rival to Pakistani President Asif Ali Zardari, saying that without Sharif’s support, the anti-Taliban campaign would be doomed. Sharif was at Monday’s All Party Congress. The Pakistani military mounted its first assault on Al Qaeda and its Taliban allies in tribal areas along Pakistan’s mountainous border with Afghanistan in 2004. There have since been a number of military offensives against the Taliban, with questionable results. 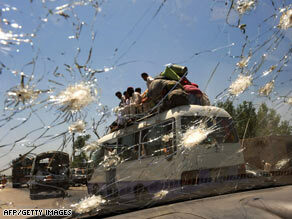 The attacks have displaced hundreds of thousands of Pakistanis and done considerable damage to homes and infrastructure.